Around this time of year my desk, and maybe yours too, desperately needs a refresh. Papers and booklets that have gathered over the winter months, long neglected items without a home and a dust bunny or two have taken up residence on my desk top by now. Now it the perfect time to strip off that desk, give it a good wiping down and rethink the items that you put back. For myself I use this time to give my work space a new look and get rid of those items I don't use often enough to keep here. 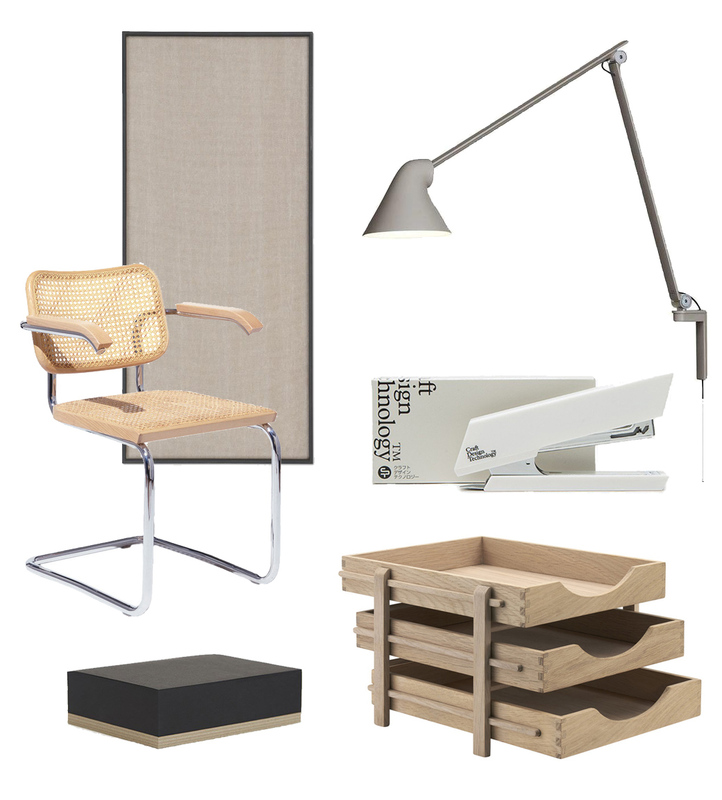 I've gathered a essential few working space items that every desk needs. Depending on the way you use your work top you may need a more more of less but some of the basics include good lighting, like this NJP wall mounted task lamp that allow you to pivot lighting where it's most needed. A memo board or pinboard like this one from Ferm Living which keeps track of small notes or images for inspiration. For all the loose papers you are sure to encounter and then have to organize, a wooden letter tray keeps everything neatly nearby. I also think Calendars for 2019 are an essential desk item for tracking important upcoming dates and deadlines. I often use a separate calendar for myself and another for the family to sort out personal and family activities. A handsome looking stapler is practical but also nice enough to keep out and not stored away in a drawer. These ITO Bindery notepads have a very minimal design but with so many uses and they come in three different sizes. Lastly, a desk chair is another essential for the workspace and if you feel comfortable with something that is not swivel based over very cushioned, this cane version below is an attractive option.